A shield is a device used to protect oneself, especially a broad piece of armor carried on the arm. In medieval times, soldiers fought with a sword and a shield. The police use shields to protect against gunfire. 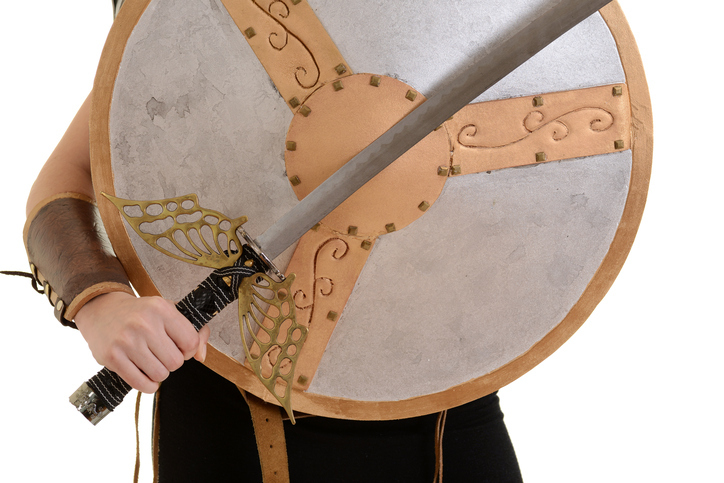 A shield is also a person or thing that protects against injury. The heat shield kept the space capsule and the astronauts cool. The umbrella worked as a shield during the hail storm. The kidnapper used his hostage as a shield to make his escape. Sara's hat shielded her face from the sun. Allen's mother shielded him from the truth about his father's crimes. Did you ever think of toothpaste as a shield against tooth decay? Watch this vintage commercial to see how toothpaste protects you. Captain America uses his shield in many creative ways. Watch this clip. There are other meanings of shield.